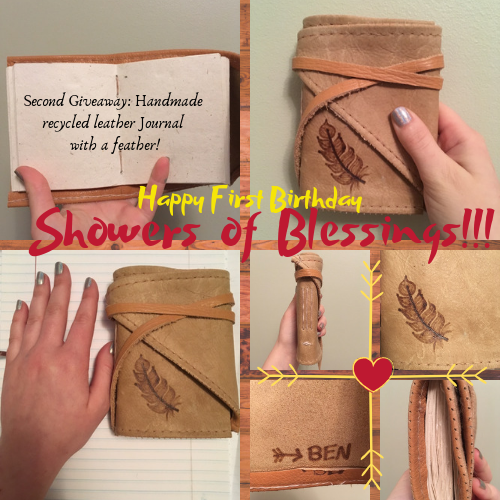 Showers of Blessings: Week #2: GIVEAWAYS // Q&A // POEMS! Week #2: GIVEAWAYS // Q&A // POEMS! It's time to announce the winner of last weeks giveaway! Scroll away! YAY!!!!! Congrats Rakayle on winning my first giveaway, the Showers of Blessings mug! Since I do not have your email, please email me using my contact form on the sidebar and we can work out the details for getting your prize shipped to you! If I don't hear from you within a week, I will draw a new name from the hat. Now, on to the next giveaway! This second giveaway is just as epic as the first! *grins* To enter this giveaway, it's easy! There is a possible 1 point each for this giveaway! This giveaway is open for one week... This giveaway is open to U.S. and international residents!!! 1. Ask me questions for my Q&A! Enter for a chance to win... *throws confetti* ...A handmade recycled leather journal with a feather on it!!! I tested my creative skills and with the help of YouTube how-to videos, I was able to make the second giveaway prize! Every writer needs a good journal, right?! I made this journal out of everything recycled (all except for the string...) This is a up-cycled journal! I used the scrap leather I had and then used horse Poopoopaper! (paper made from horse poo, yes, we bought it! Trust me, it's not Rosies! *winks*) I wood-burned a feather on it, because if ya know me at all, you know that I am a big fan of feathers and I also signed it with my initials! I then used beeswax to wax the string for the book binding! I can't wait to see who wins this journal! And that up there ^^ leads me to explain a little more on how to enter the giveaway. I am doing my very first Q&A and I need questions! To have your name entered into the drawing hat, all you have to do, is ask me some questions! It could be one question or twenty questions, however many you would like! The Q&A answers will be included in next weeks post! Now on to taking a peek into my early writing stages! I am going to share with you the very first poems I wrote! The first poem I wrote was a simple rhyme about a popcorn machine. I still have it on a 3X5 card in a special folder! The popcorn went on Dad's tie! All are creatures that God makes. Some are shy and some are bold. They will alway's look to you. Someone who's fair and trustworthy. They will become your very best friend! This next one was the first religious poem I ever wrote! I read this at the nursing home a few years ago... I like how it is simple and sweet, short yet deep! Love is never ever blind. Love sees you through the good times and the bad. Love gave Jesus strength to endure what was sad. If that is not true love, I don't know what is. His love for us, we cannot comprehend. Think about it, He loves us even though we have sinned! And trust in Him above. And because of God's love for us, we know He is alway's near. And He's the One who gives us a chance to be freed. Love is the root of anything good. And I hope that everyday we will love one another as Jesus says we should! 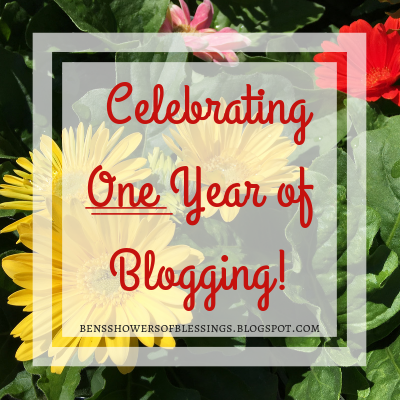 Thanks for reading this second post in celebration of Showers of Blessings one year blogoversary! Make sure to enter the giveaway by asking Q&A questions for a chance to win a pretty cool journal made by yours truly! The deadline for entering the giveaway is Tuesday the 19th at midnight. 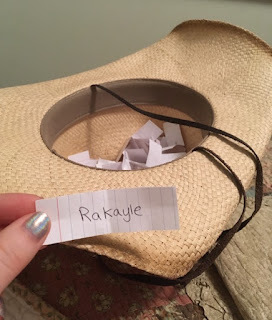 Again, congratulations, Rakayle, for winning the first giveaway!!! I will see y'all next Wednesday for some more celebration fun including the following: Q&A answers, blog throwbacks, hosting the third and final giveaway, and also announcing the winners of this weeks giveaway! Giveaway starts now! 1...2...3... Go! 1.What is your favorite dessert? 2. What is your favorite bird? 3. What is one of your favorite handmade items to make? What is your favorite soap scent you have made? I think that’s a really neat journal! What’s the best book you’ve read so far in 2019? Favorite movie and/or TV show? Favorite book of the Bible? If you could travel anywhere in the world, where would you go? Aw, I'm glad you liked reading them! who is your favorite blogger / why? How many horses do ya own? Thanks for the Q&A questions! Who was the first blogger you discovered? 1. Top three favorite books? 2. Top three favorite songs? 3. Top three favorite colors? I'm glad you like it, Faith! Can't wait to answer these! <3 Thanks for entering the giveaway! I love your poems, Brooklyne! Thank you for sharing! And CONGRAGULATIONS, Rakayle, for winning last week's giveaway!!!!! Questions? Hmmm . . .*scratches head and furrows brow in deep thought*. . . Well, let me see. . .
1. Chocolate chip or chocolate crinkle cookies? 3. Favorite Susan K. Marlow book? 4. Favorite writing utensil - pen, pencil, etc.? 5. If you could only eat one meal for a straight week, which meal would that be? So cool that I won. Thanks!! I sent you an email. All the poems are very good. The popcorn one was as so funny!! CONGRATULATIONS on winning the first giveaway!!!! I can't wait for you to get your prize in the mail! What is your favorite thing about horses? What has been your favorite thing about blogging your first year? - are you the type of person that likes to plan and organize, or prefers to do things on the fly? - what's something you wish you had the courage to do? - what's your favourite thing about today so far? Aww, your kind words to me mean more than you know! You are so encouraging... thank YOU! I am so glad to be apart of this community! Thanks for the questions, they are good ones! I can't believe it has been a year since first taking a leap of faith into this adventure! What is your favorite hymn? Who is your favorite historical figure? Who is your favorite poet? 1. If you could choose ONE book world to travel to, what book would that be? 2. If you could have one book character come alive and be your best friend - who would you choose? 3. What's your favorite quote? 4. Do you think you could survive stranded on a desolate island, if so, how would you go about it? 5. What is the most AWESOMESS (yes that is a word) thing God has done for you so far? 6. Is being a writer something you'd like to do as a career, or more as a hobby? 8. If you had a time machine - but could only use it once, where would you go? 9. When your life comes to a close, what do you want the "theme" of your "story" to be? 10. What is the most fun thing you remember doing as a child? *grimaces* I bet that Lego hurt real bad! 1. Do you like musicals? If so what is your favorite musical? 3. Would you rather live in a desert were is never rained or a place that is always snowing and is super cold? 4. What is your favorite food? 5. What is your favorite dessert? How did you decide to start blogging? What is your favorite thing about blogging? What is your favorite breed of horse? I have been reading about horse breeds. My favorite kind is a thoroughbred. What's your favorite outfit like? What's the best breakfast ever? Have you ever gone out of the country/how far have you traveled? What was the last song stuck in your head? Thank you for asking me questions, Mallory!!! Brooklyne, you seriously made that journal? It's amazing! Thanks for opening the giveaway to us overseas people. It is so nice of you to be willing to go the extra mile (pun slightly intended.). I like the poems! The notebook is beautiful!!! What is your favorite fictional book? Are you shy or outgoing? You did a lovely job with the journal. And I do have a question for you. What is your favorite part of writing poetry? -What's your favorite thing about living on a farm/out in the country? -Besides horses, what would be your next favorite animal? -What's your favorite outdoor activity? What about inside? Welcome to Showers of Blessings! My name's Brooklyne. I am a homeschool graduate who is striving to live the life that God has planned for me. When I'm not binge reading or typing wildly at the keyboard of my computer, you will usually find me spending time with my family, my horse, or knee deep in a artsy project. I believe God is good all the time, laughing is more contagious than yawning, and dogs are a girls best friend. It is my deepest hope that through the words God has placed on my heart to write, someone will gain a blessing and a desire to have a closer relationship with our Heavenly Father. 1 Week Old // 4-22-19 - The puppies turned a week old on Sunday! They are so cute and their eyes are just starting to open. The Torch Keepers // Cover Reveal! Thank you for stopping by and taking time to read Showers of Blessings!!! I would love to hear what you think of my writings, so please feel free to comment. I do ask that you use kind words that are pleasing to the Lord. Thank you for your encouragement and support! "I will make them and the places all around My hill a blessing; and I will cause showers to come down in their season; there shall be showers of blessing."